Pleasure is normally a square cake. 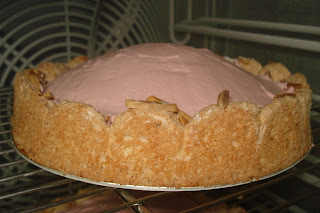 Joconde biscuit is used as the base and top. 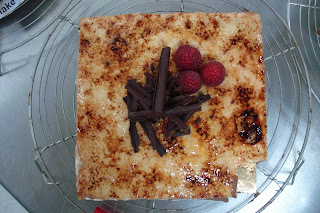 A thin coating of pate a glacer is brushed on the bottom of joconde. 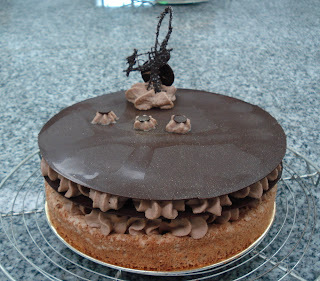 Two layers of mousse in chocolate and vanilla are placed between the joconde biscuits. A mixture of eggyolk and sugar is spread on top. 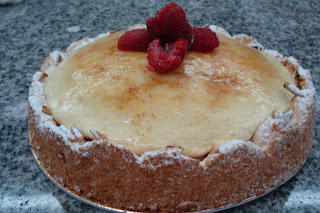 Normal sugar and icing sugar are alternately sprinkled on top and caramelized. The surface is also coated with neutral glaze. 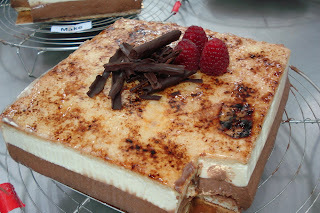 As you can see on the sides, the chocolate mousse is protruding. Unlike the Vanilla supreme, chocolate mousse has no gelatin to hold it up. Make sure the mousse is thick enough before you poure it in to the ring. If watery, then place it on an ice bath, stir constantly until it becomes creamy. A good chocolate mousse can support the weight of the vanilla supreme without sticking out. Now you know where my mistake is. I learned an important lesson again. As for the decoration, I failed to make a chocolate fan. (* see my entry on Autumn leaf). The only thing I finished on time was the cigarette. Well, that's because it's easier to scrape than the fan. BTW, the chef sliced a piece to taste it. A cake with hazelnut dacquoise base. The middle of the base is filled with crispy pailletine-feuilletine combined with hazelnut praline, hazelnut paste, milk chocolate and butter. 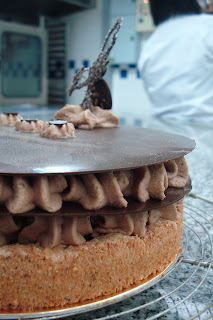 Between each layer of chocolate disk is chocolate mousse piped using the star nozzle. In tempering chocolate, be sure that it has a paste like consistency before use so you can have shiny product. Although the thermometer says how high or low the temperature of the melted chocolate is, do not depend on it much. It may not give an accurate measurement so use your eyes. When you see that the chocolate is becoming thick and creamy, that’s the only time you can say it is safe to use. This was my mistake today and the disks I made turned out matte instead of shiny. We ran out of time during practical so our Chef ended up doing disks for over half of the class. He saved us from losing our points which was good but we were unable to correct the mistake we made.